The first milsurp thing I ever bought on my own I got through the mail in about 1962 from the pages of Kaufmann Surplus and Arms. 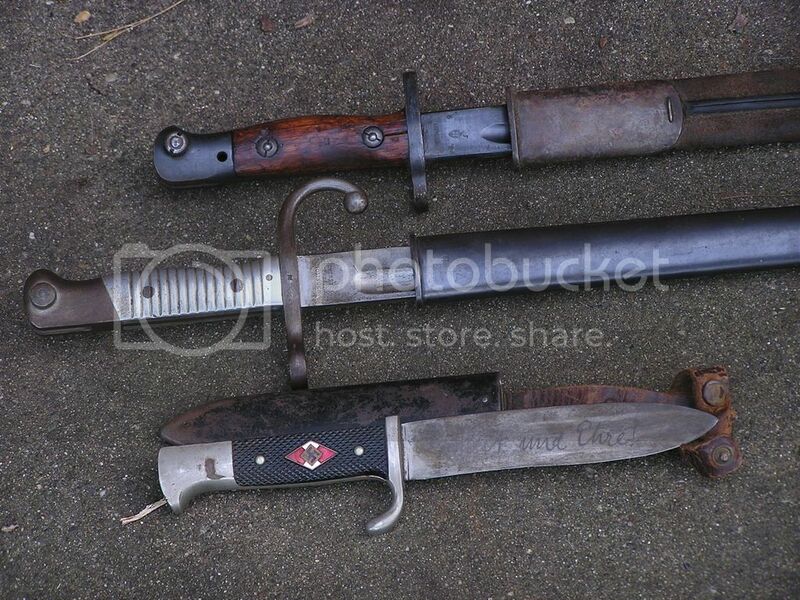 It was the Argentine bayonet below. The Lithgow bayo was a later acquisition. The Hitler Youth knife was bought by my dad at the 1936 Berlin Olympics; he was 16. He was born in Germany in 1919 and his family fled there in 1926 due to terrible conditions of inflation and starvation. Turns out it was a good move. Had they stayed in Germany things would have been different. As it was, he ended up serving in the US Navy and made it through the war. The reason this is a reunion pic of sorts is a story of the scabbards. I'd displayed the blades on my wall as a kid. When I moved out I took the knives but had lost track of the scabbards. Turns out one of my brothers snagged a box of my stuff when he moved out, and in there were the three scabbards. He came up and visited me a couple months ago and brought them. 45 years apart, and now, together again. Thats a good story with a great ending . I have had a dive knife for 20 years and Dad just saw it and told me it is my brothers that he was given for being the best in his dive class. I am holding it till his Birthday LOL . Thanks for sharing with us.